I had zero desire to see Kong: Skull Island when I first heard yet another King Kong movie was coming out. I've never really found the idea of a giant ape that appealing, in my opinion The Lost World: Jurassic Park did a much better job of a giant creature loose in a city. 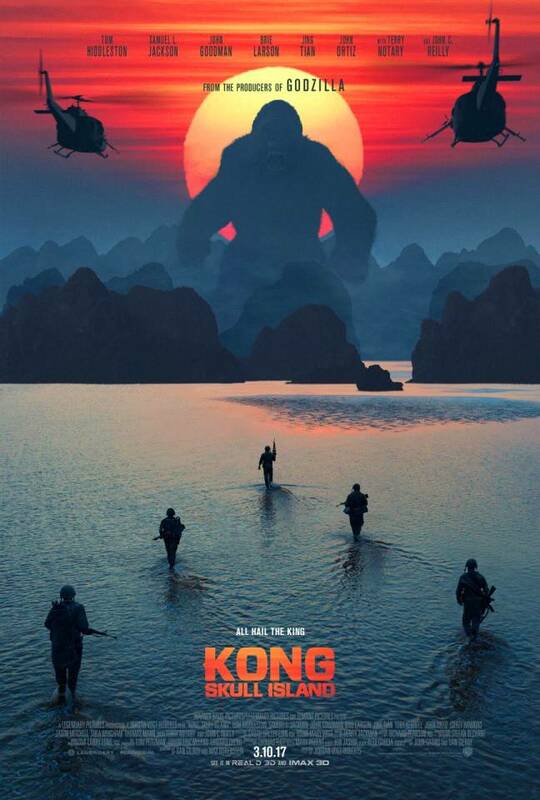 Well it turns out I really wasn't paying attention to the 'Skull Island' part, it was only after I accidentally saw the trailer that I realised this latest incarnation might not actually be that bad, an island full of giant monsters rather than an ape loose in city appealed far more. Sometimes watching a big dumb film is the perfect way to end a day, I am stricken with flu but for a few hours I was able to switch off my mind and just enjoy the spectacle; the great special effects, the over the top story, and the dull vapid characters. Having been very disappointed with Godzilla a few years back I hoped this giant would be more appealing. He is, the film opens on a huge action set piece with Kong literally obliterating the explorers and soldiers as they buzz around him in copters. He throws tree trunks like javelins, swats them out the sky, crushes the survivors under his huge feet like bugs and more. This first real action scene was so awesome to watch. While Kong becomes more of good character as the film progresses this intro to his fearsome power really made him stand out from past appearances. This also set up Packard as the film's human antagonist, having seen his men slaughtered he becomes obsessed with killing Kong. The disillusion of war at the time period feeds into his madness, having lost Vietnam he cannot stand to loose this battle as well, it makes him understandable in his motivations. It is a shame then that he is nearly the only remotely memorable character here. He is pretty one dimensional but least he has purpose. John C. Reilly shines as Hank Marlow; a World War II fighter pilot who got stranded on Skull Island, he is the films comedy character, but more often than not he hits more than he misses. I found the idea of him almost being a time traveller due to missing out on the rest of the world pretty interesting, and led to some funny moments when he asks questions about what has happened while he has been lost. The rest of the cast are forgettable to annoying. Goodman is great but only has a small role, Larson is pretty much a blank slate in terms of personality, yet it is Hiddleston's character who grates the most. With a film about a giant ape it is the character of Conrad who constantly breaks the fun with his oh so serious poe faced musings on what is going on. I lost count of the times he would valiantly and selflessly wade into the action to save the day, he reminded me of a shepherd protecting his flock of sheep, always with such a grating noble expression on his face. Without his irritating character everyone would end up dead. As it is there is a bit of a The Lost World vibe about Skull Island. The journey to the pick up point is the main focus of the plot, the group rapidly dwindle down as they get picked off one by one by the horrific wildlife. Giant spiders, huge krakens, lethal lizard like birds, Kong, and the monster based antagonists that are the skull faced creatures (that climb up out of the earth); all have their moment to kill. The special effects are all pretty great but at times especially when humans are being flung about in the air and ripped apart things look slightly strange. While the special effects were good for me there was far too much use of 'bullet time' style slow motion during key scenes that just didn't feel like it fitted in with the tone. The creatures do all look awesome, helped in no small part by the locations the group get to go to. Most vivid was a silent tribe of beautifully decorated humans whose shrine to Kong is actually a huge washed up ship. A stand out location was a giants bone yard, while bamboo jungles and rivers all play their part in creating a deadly, yet very attractive paradise. The plot is simple, yet it is enjoyable despite a lack of interesting characters. The action scenes involving the assortment of giant creatures are never anything but entertaining, especially when humans are involved. Happily when the inevitable fight between Kong and the main monster takes place it was actually pretty enjoyable, even if it was predictable. While this is a 12A in the UK there was a nice amount of violence with people being ripped apart on occasion, and going back to the Kong vs helicopters battle; boy was that a great fight to witness. 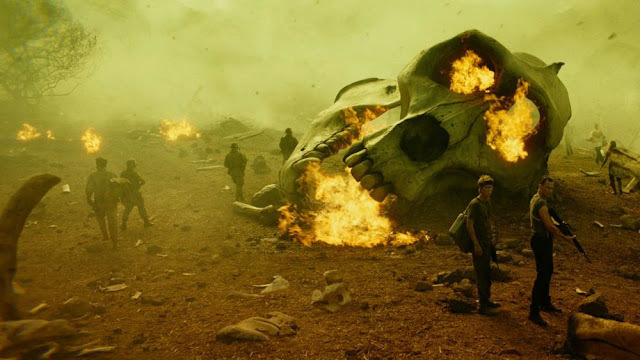 Kong: Skull Island is a bit of a hollow experience, yet at the same time it was a grand old adventure full of thrills and set pieces that delighted. The anti-war message may never really hit, though the actual saturated use of colours to echo Vietnam footage of the time was a nice idea, as was the timely soundtrack blasted out of loud speakers constantly. If you go to watch this for a bit of light entertainment then you will have fun, just don't expect anything too deep. It isn't saying too much but this is the best King Kong movie I have seen to date. Also I would say it is worth staying for the after credits sequence as it makes the possibility of a sequel sound neat.